"The world of 1911 was small in comparison to the complex world of today and work for women in it was somewhat restricted. 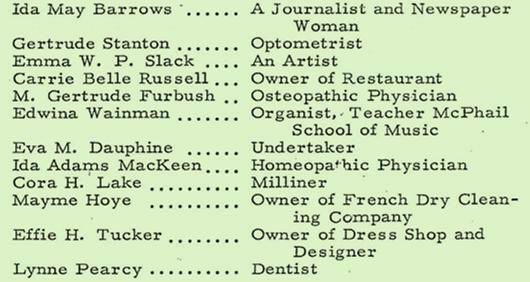 Nevertheless there was a newspaper woman in Minneapolis by the name of Mrs. Ida May Borrows, who very strongly felt the need of closer association with other business and professional women. She was not only a woman of vision but a woman of action." 1910 -A small group of women in Duluth and Minneapolis realized the importance of gathering together with like-minded people to discuss the challenges of business, to socialize, and to find ways to help the community. 1911-After forming two groups, one in Duluth and one in Minneapolis, they asked for and were denied Rotary status because they were "women only." 1987-U.S. Supreme Court ruled that a Rotary could not discriminate due to gender allowing women throughout the world to join the Rotary. But throughout all that time, the Minneapolis Women's Rotary met, networked, and served the community. 2011 -Minneapolis Women's Rotary celebrate their 100th year of serving the community. Louise Saunders was one of the first female attorneys to attain partnership in a law firm (Lindquist & Vennum) in Minneapolis. After her husband passed away, she took over his restaurant, the very popular Charley's Exceptionale Cafe downtown Minneapolis. Dorothy Dolphin began Dolphin Temporary Services after working many years in the temporary services industry and making less than her male peers. Dorothy's husband passed away at a young age leaving her with three small children, one of whom had a debilitating illness. Dorothy's determination made her one of the most renowned business women in the Twin Cities. Deb Rae brought warmth and kindness to all those she met and to the Minneapolis Women's Rotary. Her favorite adage: "Life isn't about waiting for the storm to pass, it's learning to dance in the rain." is truly a reflection of who she was as a person. She was an active and dedicated member of MWR. Alice Nelson was a dedicated member of the Minneapolis Women's Rotary for many years. She worked for Teamsters Local Union 221 until 1988, and later pursued a career in real estate. She was an active and dedicated member of the Women's Rotary, the Democratic Party and SACA. she truly embodied "Service, Not Self."